HOLLOMAN AIR FORCE BASE, N.M. — This month, three industry teams will hand over four different light attack aircraft to Air Force pilots for a series of flight demonstrations to test just how well the aircraft can prosecute targets on the ground while operating in austere desert environments. Those that prove their mettle will move on until the next phase of the experiment: a combat demonstration in the Middle East. Specifically, planes could participate in the fight against the Islamic State and other terrorist groups, Air Force Secretary Heather Wilson told reporters Wednesday. The Air Force won’t know for sure whether it will pursue a combat demonstration until the experiment at Holloman Air Force Base is finished. Then, the service will take the data it has collected and assess the aircraft cost, capability and the manufacturer’s production capacity. 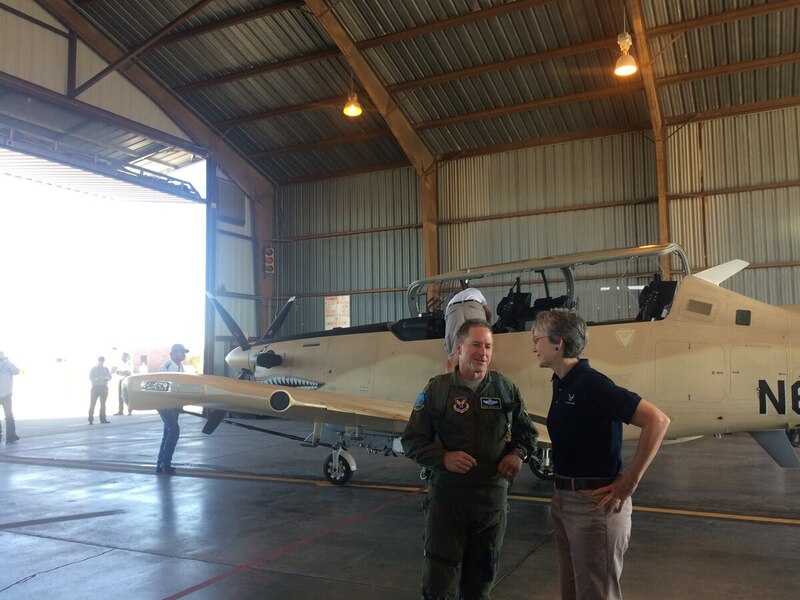 Reporters headed to Holloman AFB on Wednesday to get a glimpse of the four aircraft participating in the demo: the A-29 from Sierra Nevada Corp. and Embraer, the AT-802L Longsword by L3 and Air Tractor, and the AT-6 Wolverine and Scorpion jet, both by Textron. They weren’t the only interested parties. Several top Air Force officials also visited the base to observe the experiment, including Wilson; Chief of Staff Gen. David Goldfein, who flew both the A-29 and AT-6 today; Gen. Mike Holmes, who heads Air Combat Command; and Lt. Gen. Arnold Bunch, the service’s top uniformed acquisition official. Representatives from about a dozen international partner militaries also attended, including members from Canada, Australia, the United Arab Emirates and Paraguay. Although there is no real winner of the light attack demo, the A-29 Super Tucano and AT-6 Wolverine already seem to be a step ahead of the other options in terms of moving on to the next phase. Both aircraft have been categorized as “tier one” by the service for the purpose of the experiment, meaning that they meet all of the Air Force’s objectives, which include the ability to take off from unimproved fields and having an ejection seat. Should the Air Force decide to press on with a combat demonstration, it would likely continue to evaluate those two planes, Bunch said. “If the two ‘tier ones’ are successful in executing the first phase of the experiment and they want to continue to participate in the experiment, we plan to work with the combatant commanders to utilize both of those resources if they want to go forward,” he said. But the “tier two” offerings — the Scorpion jet and AT-802L — won’t necessarily be left behind. Or those companies may choose to go a different direction with their platforms. The experiment’s criteria were heavily centered around the needs of Air Combat Command, Bunch acknowledged. However, the requirements of other potential customers, such as the special operations community or international partners, may be different. If Wilson and Goldfein approve a combat demonstration, Air Combat Command (ACC) will take the reins from Air Force Materiel Command, which is executing the experiment at Holloman, Holmes said. Col. Michael “Starbaby” Pietrucha, ACC’s staff lead for light attack, said the command is already starting to consider how it could execute a combat demonstration. Though much is still to be determined, the demo will likely involve bringing light attack aircraft to the Middle East and having it fill in for other aircraft, like the F-16 or A-10, when low-end missions need to be executed. A future combat exercise might also emphasize the aircraft’s ability to network with coalition ground forces.